Let me be clear that most people treat my boys with respect and extend infinite patience in carrying on conversations with them. One of my boys is passionate about vehicles. He knows all the makes and models, reads the consumer reports, and can tell you which ones are recommended. He will stop anyone and everyone and carry on a conversation about vehicles. If people ignore him, he just gets closer and repeats his question. Adults understand this type of behaviour and carry on a conversation. Peers expect to have a conversation that may include a discussion about vehicles, but will also include many other topics. When this doesn’t happen, peers tend to respond in one of two ways: avoidance or interaction based on pity. Some peers will answer one or two questions and then move on. Others will continue to reach out, but the relationship is more of an older brother or sister dealing with a younger sibling. I’m not sure my sons recognize what they are missing. Is that a good thing? Yes, in that the sting of rejection is not felt by them. No, in that there is no motivation to change, except to comply with an adult who is telling them they should or shouldn’t do something. My boys are more than happy to lose themselves in a book or play on their iPads instead of conversing with peers. We all tend to stick to situations where we feel safe, and they are no different. The difference is that most people have a larger repertoire of skills to call on when dealing with social situations, especially difficult ones. As a parent, there are many times I don’t know how to deal with this issue of helping my boys build authentic peer relationships. We’ve tried speech therapy, small group therapy, taking our boys to places they will be able to interact with peers, and modelling expected interactions. Sometimes we push our boys into situations they would not choose on their own. Other times we allow them to make the choices. I’m thankful for the people who make the time to interact with our boys, but I do grieve for them and hope that some day they will have a friendship based on more than choice and respect. 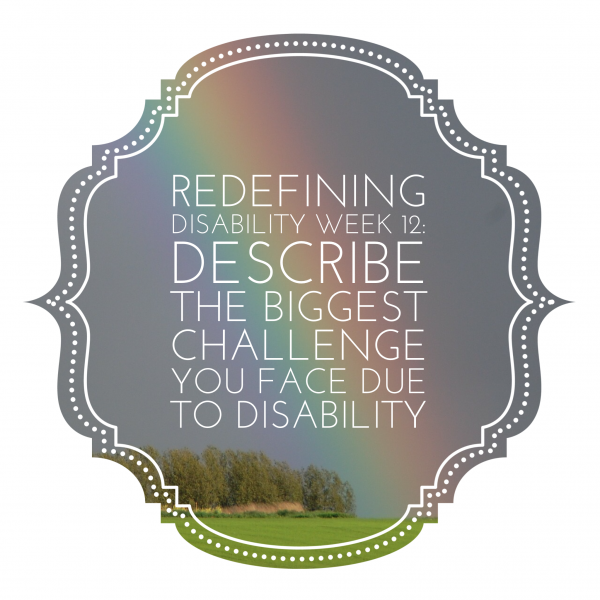 What is the biggest challenge you face in dealing with disability? In 2014, Rose Fischer started a Redefining Disability Challenge. This year she is continuing to invite people to join the challenge by blogging about a set of questions she developed. I’ve decided to join this challenge and most Mondays (or Tuesdays!) will be answering one of her questions. Mine is traveling in cars for long distances….I end up with severe anxiety attacks. Doesn’t stop me from travelling, but we do prepare for those possible attacks. Thanks for sharing. There are all kinds of challenges and it’s best if we can prepare, but still encourage participation as much as possible. What helps deal with the anxiety?